"On the other side of the pier, in the slip occupied by the two greatest oceanic liners afloat, lay the Normandie and the Queen Mary. There had been a rumor that the Queen Mary might slip out during the night and try to get back to the mother port, and though it was no weather for a fireside adventurer to be abroad in, I went down to the waterfront, just on the off-chance that something would be afoot. In her dull, battleship gray she looked like a ghost ship, but if she intended to make a break for it, there was much that needed to be done. Her funnels were covered. Already the salt had caught her great anchors. Her chains were rusty and a great drift of river moss which she had brought up from the bottom trailed from her anchors to waterline. She rode high, which bespoke an empty hold. Her lifeboats--nine rows on each side--were canvas covered and locked. As I eyed her mighty prow Officer 4447 eased up beside me. I showed him a card which asked that all police help me in whichever way is possible--a reporter's police card. "That's all right," he said. "Ordinarily they don't want strangers to stand around here." He was very nice, very courteous. Pier 90 is a city pier, and that is why the city's police are on guard...If anything happened to the Normandie, or the Queen Mary, the city would have to answer some embarrassing questions. 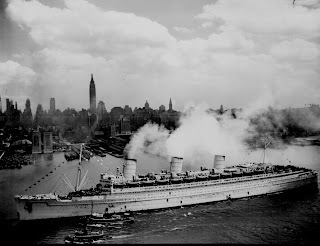 I tried to count the portholes along the limitless sides of the Queen Mary, but gave it up after 79 had been reached. There were too many, and the distance too gray and far. A good guess is that the Queen Mary will sit tight until the end of the war. She and the Normandie would be Utopian prizes for a U-boat captain..."